Dallas Arboretum's Cool Thursdays Concerts Return! You are here: Home / Dallas/Fort Worth Events / Dallas Arboretum’s Cool Thursdays Concerts Return! Dallas Arboretum’s Cool Thursdays Concerts Return! The premier concert series “Cool Thursdays” at the Dallas Arboretum, sponsored by Wells Fargo Bank, is back in action. 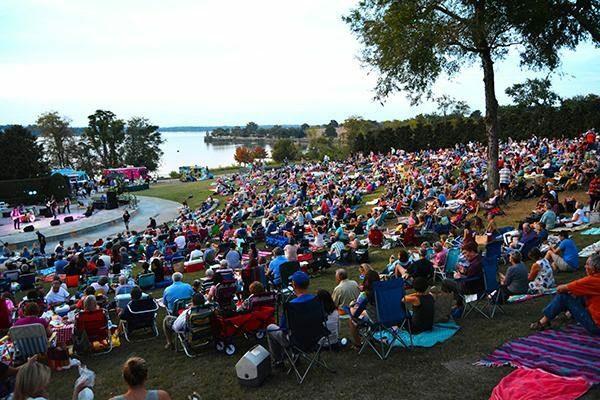 As Dallas’ only concert series overlooking the picturesque White Rock Lake on the award-winning Martin Rutchik Concert Stage and Lawn, tickets have been selling fast and selling out. This year the series will kick off on March 17 with a new band, Downtown Fever: The Favorite Variety Party Band. Downtown Fever is guaranteed to make any event unforgettable. Expanding on the experience and talent of The Emerald City Band, Downtown Fever has entertained thousands with their high-energy approach and style. Whether performing at a high-profile corporate event, wedding, night club or special event, Downtown Fever knows how to bring a party to life and the crowd to their feet. This professional eleven-piece party band provides a musical range that spans decades of standards and classics to the current hits of today. In addition to the coolest view of White Rock Lake, attendees may bring picnics and beverages or purchase food from some of DFW’s Best food trucks including Jack’s Chow Hound and The Guava Tree. The concert series continues every Thursday this spring and again in the fall. Gates open at 6 p.m., and the spring concerts begin at 7:30 p.m. Single tickets start at $10-$27 and are available for purchase online. For group tickets of 15 or more, call 214-515-6520. On-site parking is complimentary for all concerts and we encourage our guests to take advantage of the close covered parking available at the parking garage. More information is available at www.dallasarboretum.org or by calling 214.515.6500.